One of the coolest drinking establishments ever conceived will finally be opening in a couple of weeks. 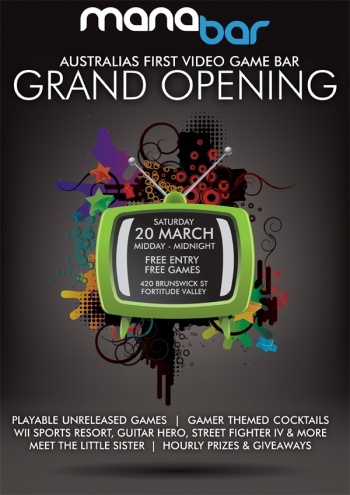 Australian videogame and alcohol fans, mark your calendars, the Mana Bar will officially be opening on March 20, 2010. The Mana Bar, explained by Yahtzee here, aims to meld a classy bar with a partial videogame theme, but while remaining a place where both non-gamers and gamers can enjoy a night out on the town. Located in Brisbane, Australia, the Mana Bar was partially conceptualized by Ben "Yahtzee" Croshaw, known here on The Escapist for Zero Punctuation. Patrons will be able to order up a vodka tonic and then sit down to play a nice game of Guitar Hero. Other titles will be on hand too, such as Wii Sports and Street Fighter IV. It appears as if the establishment has a strict "no cover charge" policy, and playing the games will also be completely free. The future also holds many special events for the Mana Bar, including the hosting of demos for videogames not yet released. For the first launch weekend, Xbox Live Arcade title Raskulls will be on display, currently in development by Brisbane-based Halfbrick Studios. With the addition of hourly giveaways, special guests, live entertainment, and more, I know if I lived in Australia that Yahtzee would have to kick me out every night. There's also something on the launch flyer that says you can "meet the Little Sister," which I'm intrigued about. For more information, visit the Mana Bar's website and sign up for the forums. Let's hope it becomes so big that Mana Bars will spread across the Earth. For now, non-Australians like myself will simply have a fun place to go when we visit the land down under.